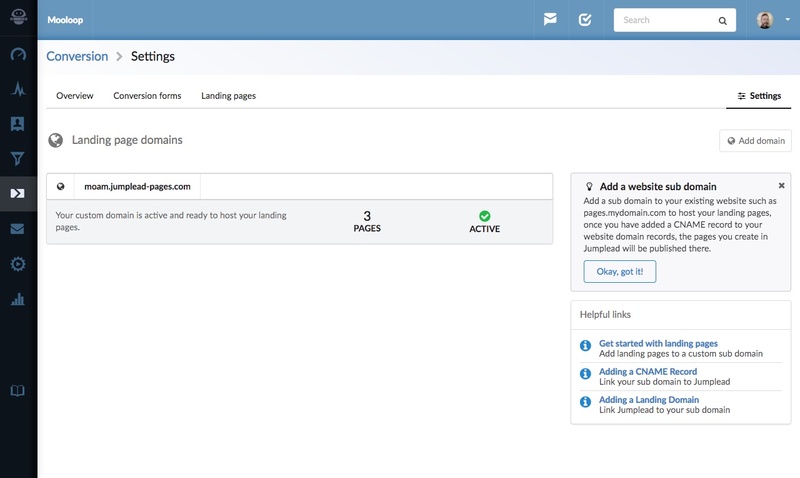 Once they’re up and running Landing Pages give you the ability to easily create and manage multiple pages with minimal effort. But there are a couple of steps you’ll need to complete to get them set up correctly. 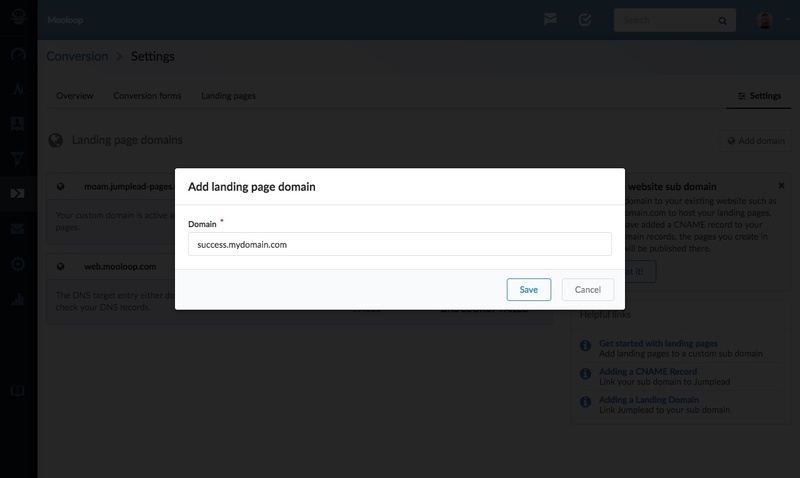 To set up landing pages you will need to have control of the DNS settings for your website’s domain, this will allow you to add a sub domain and point it to Jumplead (see below). Then you can easily create any number of landing pages within Jumplead and they will automatically appear on the sub domain of your website. For example our domain is ‘jumplead.com’ and we use the sub domain ‘go.jumplead.com’ for our own landing pages. A CNAME record allows you to forward a sub domain to another web address, this is how landing pages can look as though they are actually part of your website, whilst being controlled and managed from within Jumplead. Sign in to your domain management admin centre. Create a new CNAME record for your subdomain. For example, if you have chosen ‘success.mydomain.com’ as your subdomain create the record for ‘success’. Allow up to 48 hours for the changes to take effect. All done! The CNAME will need a little time to propagate, but as soon as it has your custom subdomain will point to Jumplead. Note: Some hosts will require you to place a period after pages.jumplead.com, so pages.jumplead.com. You can use a DNS Lookup tool to check that your host is setup correctly. From the ‘Conversion’ section of Jumplead click on the Settings icon. The settings page should already have a pre-configured domain for you to use, to add your custom domain click the ‘Add Domain’ button. You’ll be taken to a new page to add your domain, in our example we’re using ‘success.mydomain.com’. Click on ‘Save’ and you’ll be taken to the overview page where your domain will be added to the Landing Domain list. We’ll test it to make sure it’s set up correctly, and once it is it’s status will become ‘Active’.